RIM’s highly-promoted 9800 Torch “iPhone killing” BlackBerry hit the scene yesterday, to a mixed reception. But whatever shine the event added to RIM was quickly taken away as Saudia Arabia banned BlackBerrys outright. RIM’s highly-promoted 9800 Torch “iPhone killing” BlackBerry hit the scene yesterday, to a mixed reception. But whatever shine the event added to RIM was quickly taken away as Saudi Arabia banned BlackBerry services outright. Seemingly moments after RIM unveiled the new 9800 BlackBerry–a slider touchscreen version of its iconic smartphone, bearing a new OS and slicker iPhone-eqsue features–the government of Saudi Arabia announced that a blanket ban on BlackBerry service in the nation would occur from this Friday, Aug. 6, onward. It’s already ordered the nation’s cellphone providers to cease BlackBerry service support from that date. The conspiracy-minded will wonder whether the government chose the announcement time to particularly hurt Canadian company RIM. But perhaps the timing is more a reflection of the recent moves to ban BlackBerrys in the UAE. 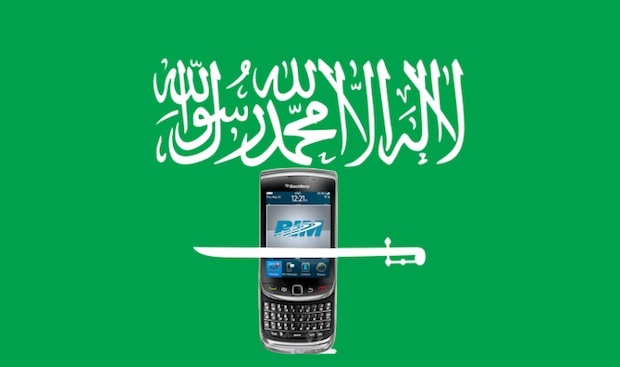 The Saudi government is angry about exactly the same issue as the UAE’s is–RIM’s high security protocols, foreign-hosted servers, and their inability to snoop on BlackBerry users’ activity, with a rider that some users may be using the devices to contravene national interests. Perhaps the authorities are also angered by RIM’s statement, released yesterday, that noted its secure email servers were a matter of pride, and that it could not bend to the whims of “government of one country” over and above the service it offers to all nations. Consequently as of Friday, the nation’s 700,000 BlackBerry users will find themselves in possession of smartphones that have all the BlackBerry “smart” removed, leaving behind a very expensive dumbphone that’s just about good enough for audio phone calls. It’s highly plausible that this yet another boon for Steve Jobs’ iPhone, cause for Saudi BlackBerry fans to switch to an Apple–or Android–device, knowing their emails may be overseen by the government, but still able to benefit from the convenience of push email services for real-time business uses. We don’t see RIM bending to the government’s wishes anytime soon, nor do we know what the authorities specific requests are–they’ve just banned BlackBerry powers because they disapprove. Coming at a time when RIM’s latest phone is being met with a slightly chilly response in the media (because glancing through the device’s specifications list reveals nothing particularly stand-out in terms of technology that isn’t already present on the iPhone or one or more Android phones) this is just very bad news. Update: A piece at Reuters has reminded us of one curious fact about RIM’s BlackBerry phones–the U.S. government can legitimately spy on user activity made on the devices, despite their high security. All it takes is a court order (or some slick abuse of wiretapping laws–take your pick). RIM may be wary of giving Saudi or UAE governments access to user data as it’s concerned about human rights implications, but the U.S. government is one it has to kowtow to.